Adult literacy volunteers provide instruction in Adult Basic Education (ABE), reading or math, and English as a Second Language (ESL). 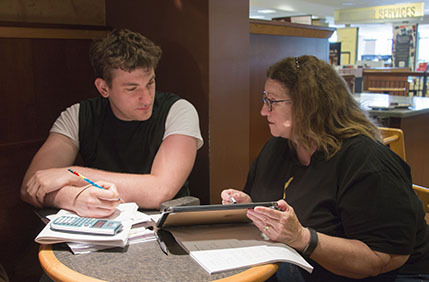 Volunteers typically work one-to-one with students. Volunteers make a tremendous difference in the lives of those who are learning English or improving their basic reading or math skills. It takes a special adult to be a literacy volunteer – someone who desires to serve others, someone who is willing to work with adults as a peer. Besides helping students learn to speak and read a new language, volunteers assist with helping people learn the life skills they need in a new country. Volunteers also help adults increase their education levels, which builds a student's confidence and self-esteem. Learn more about being a literacy volunteer. You don't need teaching experience nor do you need to be able to speak a second language to become a literacy volunteer. Come join us! This project was made possible by a grant awarded by the Illinois State Library, a division of the Office of Secretary of State, using funds designated for literacy. Learn more about the Adult Volunteer Literacy Grant program.